In this chapter the goal is to describe my implementation of the i2Flex in two consecutive academic years in an attempt to meet more effectively the educational needs of the new generation students. Starting with the description of the i2Flex methodology in an IB French class as a member of the pilot i2Flex faculty at ACS Athens, I will present the instructional (re-)design of my Moodle shell to reflect the new teaching methodology, and the need to evaluate this pilot year via an appropriate framework. Then, I will describe the same class in the second year, from how i2Flex was at this point implemented to how it was evaluated and what data was collected from the students. 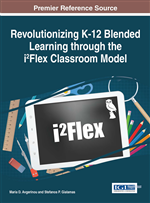 Finally, the goal is to share under the umbrella of best practices how meaningful and efficient the i2Flex is, taking in consideration the new role of the teacher in and out of class and its unique potential for student learning. When Albert Einstein stated “The true sign of intelligence is not knowledge but imagination” (www.quotes.net/authors/Albert+Einstein, 2015), he could probably not have predicted that learning in the 21st century would be so much related to imagination and, particularly creativity. At ACS Athens, according to our school philosophy, we challenge our students to use their unique skills and talents, and create their own learning pathways. Having that in mind and at the same time, realizing that nowadays we have a new type of learners – the so called digital learners (Prensky, 2001)-- who prefer hyperlinked information, and enjoy working in teams collaborating, sharing and exchanging ideas, we understand that the teacher gets a more demanding role, as she needs to prepare students not only for their university studies but also for the future life as global citizens. Therefore, the teacher as a lifelong learner herself, who wants to have a proactive role and serve her students with both their current and future needs in mind, should be prepared to take risks and try innovative methods of teaching and learning. When last year, we were exposed to the i2Flex methodology, I could not imagine that this methodology would change so drastically the entire concept of learning in our classes, and my own teaching philosophy in particular. But to explain what I mean, I need first to offer my understanding of the definition of i2Flex: the first i stands for independent student learning, the other i stands for inquiry-based student learning, while by Flex we mean a face-to-face, flexible, guided student learning supported by technology. i2Flex in my classes meant that expectations I used to have from my students now needed to change, as the expectations from myself as a teacher also needed to change. The picture of the active learner I had in my mind, was now replaced with a new model of the engaged student, who navigates successfully the learning process in a combination of independent and teacher-guided learning activities and, when she meets with the teacher in the face to face part, is able to engage in meaningful discussion at the higher levels of Bloom’s revised taxonomy (Anderson & Krathwohl, 2001). The i2Flex came as a gift to meet the digital natives/students’ needs, moving teaching and learning in a different yet refreshing direction. The shift from the old traditional classroom where the teacher was the center of the world to a new inspiring and interactive class where the student is the center of attention moved the learning process of my classes closer to the global morfosis paradigm (gMp), which is an educational approach that promotes a holistic educational experience for all young people. It also means understanding and successfully combining the academic, emotional, physical, intellectual and ethical components to ensure a healthy, balanced individual who will successfully cope with the changes involved when entering higher education as well as the changes that life brings. Following all the above, it is clear that according to Dr. Gialamas, the Educational Paradigm of Morfosis is based on the following basic educational principles: holistic, meaningful and harmonious guided by Ethos, which is described by C. S. Lewis as “doing the right thing when no one is watching” (ACS Athens website). My own i2Flex experience is based on my French IB class during the last 2 years that I have been implementing this innovative methodology. Even though I have been teaching French IB for 16 consecutive years, this new approach of teaching and learning inspired me to further improve as an educator, and also familiarized me with the Community of Inquiry (CoI) (2000, in Community of Inquiry Framework site, 2015) framework so that I could investigate in depth my students’ satisfaction via it. In particular, in the 2nd year of i2Flex implementation, this investigation became the focus of my own Action Research project in order to explore the effects of the i2Flex in my French IB class.